The latest reviewed version was checked on 27 June 2013. There are template/file changes awaiting review. 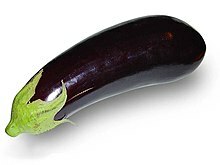 Eggplant (also known as aubergine) is a shiny bulbous vegetable in the nightshade family that comes in green, white, or, more commonly, purple. The eggplant itself is actually a berry, and its edible watertight skin and disc-like seeds show clearly its similarity to peppers and tomatoes. Unlike its cousins, however, the eggplant has a firm, dense flesh that is too bitter to eat raw. Eggplants range in size from large purple gourds bigger than a person's hand to tiny marble-sized green Asian eggplants. The smaller varieties are said to be less bitter and to need less preparation. Many people find eggplant to be an acquired taste. Its versatility leads to eggplant dishes in many different cuisines, from Japan to India to Italy. Eggplant can be a very bitter vegetable, requiring special preparation to minimise this bitterness (see the section on preparation below). Some modern varieties of eggplant are bred to be free from bitterness, and can be cooked without the preparatory methods. Experimentation may be needed to balance any bitterness with sweeter flavours within the same dish or meal; this is why eggplants and tomatoes work so well together. The usual preparation method for reducing the bitter taste of eggplant involves slicing, washing and then rubbing the vegetable with salt. The salt pulls out the bitter juices via osmosis, so when preparing it is often best to put the slices of eggplant on a rack over a sink or on paper towels. Wash the salt off after at least thirty minutes, dry thoroughly and cook the eggplant as desired; keep in mind that often a small amount of salt remains in the flesh, so the amount of salt added during cooking may be less than you might think. When the eggplant has been "purged" in this manner, the flesh becomes much more absorbent and flexible, like a sponge, and is excellent at absorbing other liquids and flavors. Be aware that the eggplant can absorb more oil than any other vegetable. Another cleaning method is to simply soak the pieces in clean cold water or milk for thirty minutes. Once prepared, eggplant may be stuffed, grilled, fried, baked, or stir-fried. It is an essential ingredient in several savoury dishes, most notably the Greek moussaka. In tropical climates, eggplants are grown all year round, with a peak season in the fall. In colder regions, they can only be grown in greenhouses or imported. This page was last edited on 27 June 2013, at 14:13.